I’ve never been much for deer lures, the ones I tried never really seemed to work and man are they expensive! I tried them all too, looking for that “magic potion” to bring the big bucks running. Looking back now, my mindset was wrong. What I needed was something to “cover up” what scent I may not have been able to eliminate with my scent ritual, and I found it! Conquest Scents, formerly Border Crossing Scents makes a product called Evercalm. This product is a combination of deer urine, feces, hair, etc. and in short, it smells like “deer”. I use it on my boots to cover my entrance and exit from stands, wipe it on trees in my shooting lane, put it on the tree I hunt in at the base and at stand level, and when I get in my stand I shave some off the stick and toss it in different directions. When all is said and done, I have created a “pocket” of deer scent around my stand. You would not believe how many times I have watched deer directly downwind of me start “looking” for the deer they smell, it’s crazy! I even had a big 10 point in Illinois a couple years ago bust me moving in the tree but I could see when he caught a whiff of the Evercalm he did just that, he calmed right down and that was the last mistake he ever made! I’m always looking for an edge on big bucks, anything to give me that extra second to get my camera on him or get an arrow in him – Evercalm has given me that edge! 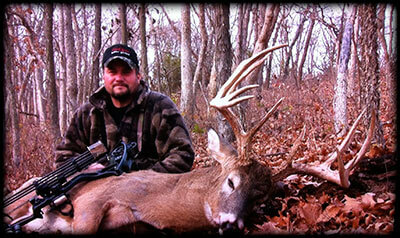 Oh, and did I mention that Conquest Scents are the ONLY company in the hunting industry that owns their own deer herd!!! Only the real stuff here, give it a try! Their new stink sticks are great for hanging in your shooting lanes also for marking distances and putting their scents right where they need to be! Filed Under: The Right Equipment Equals Success!